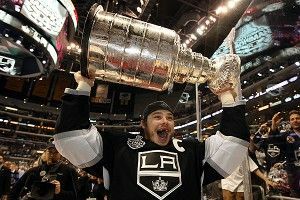 Our Grantland hometown heroes, the Los Angeles Kings, ended a 45-year title drought and hoisted the Stanley Cup on Monday after a 6-1 win over the New Jersey Devils. That means there are probably a lot of new Kings fans today (Hey guys. There’s always room on the bandwagon! ), so we asked hockey stat guru Jonathan Willis to break down the key numbers behind the series. Pull up a chair and let’s learn something! Fenwick is a combination of goals, shots, and missed shots, and gives a strong indication as to which team had possession in the offensive zone. With defenseman Drew Doughty on the ice at even strength in Game 1, the Kings dominated Fenwick, with 20 shots and missed shots to the Devils’ seven. With Doughty off the ice, the Devils had a slight edge in possession, with 18 combined shots and missed shots to the Kings’ 14. Jonathan Quick proved himself time and again over the Kings’ postseason run, but if there was one game in the Finals where he was indisputably the difference, this was it. New Jersey matched Los Angeles shot for shot in Game 2, and the decisive factor was the play of Quick. 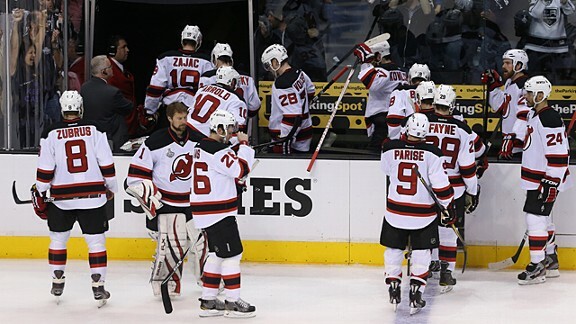 He outdueled legendary Devils goaltender Martin Brodeur, helping lift the Kings to a 2-0 series lead. With the game goalless late in the first period, the Devils got a golden opportunity to get back into the series when Mike Richards and Jeff Carter took back-to-back penalties. Aside from the fact that both forwards are fixtures on the Kings’ penalty kill, only one minute was gone in Richards’s elbowing minor when Carter was dinged with four minutes for high-sticking. The Devils had a 5-on-3 advantage for a whole minute and failed to convert; in the first 40 minutes, the Kings would be assessed with 12 minutes in penalties to the Devils’ two, and yet New Jersey could only muster three power play shots on the night. The Devils needed to shut down the Kings’ dynamic top line of Anze Kopitar, Dustin Brown, and Justin Williams. In Game 4, they managed to do just that, using the same by-committee approach to team defense that they utilized throughout the postseason. Every defense pairing on the team played more than three minutes of head-to-head action at even strength against Kopitar, and every line faced him for at least a minute and a half. The Kings’ top line failed to generate offense, with a single power-play assist from Kopitar the only real output from the trio. One of the reasons the Devils were able to eke out a Game 5 win was because of the heavy defensive load taken on by their top line. At even strength, the Devils took 19 face-offs in the defensive zone and just eight in the offensive zone, with the trio of Ilya Kovalchuk (12), Zajac (10) and Zach Parise (9) getting far more work in their own end than in the offensive zone. They were on the ice for L.A.’s only goal of the game (a communication error between Parise and defensemen Mark Fayne and Andy Greene), but for the most part, they cleared their own end quickly and efficiently. The only shot against the Devils with Zajac on the ice, despite that defensive load, was the one on which Justin Williams scored. Steve Bernier made a Game 6 blunder that he’ll likely never forget. The Devils’ fourth-liner hit Los Angeles defenseman Rob Scuderi face-first into the boards midway through the first period of the deciding game, bloodying Scuderi, who lay on the ice for several minutes before being helped to the Kings’ dressing room. Bernier was assessed a five-minute major and a game misconduct. In those five minutes, the Kings would score three times. Jonathan Willis writes at the Edmonton Journal and Oilersnation, and is a co-author of Hockey Prospectus 2011-12. Follow him on Twitter at @JonathanWillis.